To feel one’s best, one must look their best. And sometimes, it’s important to give your pets some TLC. From pampering spa treatments to basic washes and blow drying, your four-legged friends deserve the best. Here are the 10 best pet groomers in North Carolina. From excellent customer service for both pup and you to the brilliant result afterward, Bark Pet Grooming of Raleigh is one of a kind. Set up an appointment with a groomer that has groomed pets since 2003 and you will have the peace of mind that the experience will be a calm, enjoyable one. After an hour to an hour and a half, your happy pet comes out cleaned up and as satisfied as you are! If your best furry friend needs grooming, look no further in Monroe than BFF Pet Grooming. Your fur babies will feel right at home with a kind staff that is both CPR and pet first aid certified. Spa treatments, dental services, full-service grooming and more, BFF Pet Grooming treats every pet like their own, and your pet will come out fresh, clean, and happy that you stopped in! There’s no better dog than a soapy and clean dog! The Soapy Dog of Asheville has many services with amazing benefits. Teeth brushing to clean up a dog’s pearly whites, a bath and brush or trim, or a full groom with the complete package. Rather bathe your dog yourself? No problem! The owner has access to shampoo, towels, aprons, grooming brushes, and the blow dryer to get the job done. Your dog will leave with a happy heart and a wagging tail after their grooming. Jael and staff are prepared to make every pet comfortable with both patient, and kind attention. They do incredible jobs with your fur babies. Full groom, nails trimmed and filed, an express bath and de-shedding treatment—all are affordable and done with care in the perfect place with a clean facility. Opened in 2009, walk in with a dirty pup and walk out with a happy one! Schedule an appointment and be greeted by the amazing, friendly staff members. Fido is in terrific hands with the best of care and can soak in all the love and affection during their grooming. Treatments are tailored to the breed and size of your dog. “Only the best because they are family.” The Top-Notch Pet Spa of Raleigh lives up to its name through a comfortable visit to the spa, and the delightful results to match. The groomers on the staff have a combined 47 years of experience to provide the best expertise for every puppy personality. Every dog will benefit from the groomer’s use of only the best products to give them a shiny clean coat. Are you ready to take home a happier and healthier pet? Modern Pet Salon has award-winning service to pamper your pooch with a bath, a full grooming, or the full spa treatment. Your pet will feel well cared for by the patient, stress-free experience offered by this Matthews’ location of highly trained professionals. Open for 23 years, Pets U Love treats your furry babies just like their own. Drop them off for a grooming, and you will feel best knowing they are being loved, played with, and cared for greatly. 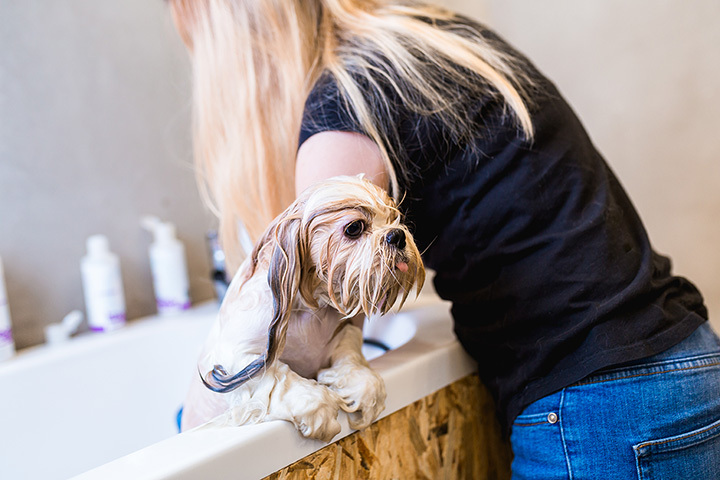 The grooming is complete with a cut, bath, nail trim, and cleaning of the ears with the ability to add bath extras for a small additional fee. Walk out with a happy, clean pet at exceptional prices. For all your grooming needs in the Concord area, Barks & Bubbles has a variety of services from baths to haircuts. Services alongside haircuts and baths include nail trims, ear cleanings, and face trims and de-shedding for dogs. The prices are reasonable, and the staff members make even the most nerve-wracking experience for any anxious pet a pleasant one.